Background Intentional rounding (IR) is a structured process whereby nurses conduct one to two hourly checks with every patient using a standardised protocol. Objective A realist synthesis of the evidence on IR was undertaken to develop IR programme theories of what works, for whom, in what circumstances and why. Methods A three-stage literature search and a stakeholder consultation event was completed. A variety of sources were searched, including AMED, CINAHL, MEDLINE, PsycINFO, HMIC, Google and Google Scholar, for published and unpublished literature. In line with realist synthesis methodology, each study’s ‘fitness for purpose’ was assessed by considering its relevance and rigour. Results A total of 44 papers met the inclusion criteria. To make the programme theories underpinning IR explicit, we identified eight a priori propositions: (1) when implemented in a comprehensive and consistent way, IR improves healthcare quality and satisfaction, and reduces potential harms; (2) embedding IR into daily routine practice gives nurses ‘allocated time to care’; (3) documenting IR checks increases accountability and raises fundamental standards of care; (4) when workload and staffing levels permit, more frequent nurse–patient contact improves relationships and increases awareness of patient comfort and safety needs; (5) increasing time when nurses are in the direct vicinity of patients promotes vigilance, provides reassurance and reduces potential harms; (6) more frequent nurse–patient contact enables nurses to anticipate patient needs and take pre-emptive action; (7) IR documentation facilitates teamwork and communication; and (8) IR empowers patients to ask for what they need to maintain their comfort and well-being. Given the limited evidence base, further research is needed to test and further refine these propositions. Conclusions Despite widespread use of IR, this paper highlights the paradox that there is ambiguity surrounding its purpose and limited evidence of how it works in practice. In 2013 the Francis Inquiry1 examined evidence about the reasons for failures in patient care at Stafford Hospital, UK, and made recommendations for improvement. One of these recommendations was that ‘regular interaction and engagement between nurses and patients and those close to them should be systematised through regular ward rounds’ (p1510).1 This recommendation has become synonymous with ‘intentional rounding’ (IR), a structured process developed in the USA and marketed by the Studer Group,2 whereby nurses carry out one to two hourly checks with every patient using a standardised protocol and documentation (box 1). An opening phrase is used by the nurse to introduce his or herself and to put the patient at ease. Scheduled tasks are then performed. Positioning—making sure the patient is comfortable and assessing the risk of pressure sores. Personal needs—assessing patients’ personal needs, including whether they need assistance with getting to the toilet. Pain—asking patients to rate their level of pain on a scale of 0–10. Placement—ensuring any items a patient needs are within easy reach. An assessment of the care environment, such as checking the temperature of the room or any fall hazards. Ending the interaction with a closing phrase such as “Is there anything else I can do for you before I go?”. The patient is informed of when the nurse will return. The nurse documents the round. Box as cited in ref 15. The UK government’s response to the Francis report expected all National Health Service (NHS) hospitals to implement IR within 1 year,3 4 reinforced by a ‘comply or explain’ approach used in Care Quality Commission hospital inspection,4 and as a result IR has been introduced in the majority of hospitals. A number of benefits have been claimed, including a reduction in call bell use, falls and pressure sores, and increased patient satisfaction.2 5–8 However, substantial limitations to this evidence base have been highlighted, including concerns around selection bias, potential conflict of interest, and weaknesses in study design and analysis,3 9 10 which may, in part, be due to what Marshall et al 11 would say is the urge to act combined with the absence of a scientific approach to improvement science.12 In line with recommendations for evaluative approaches in improvement science advocated by Don Berwick,13 for this study we adopt a realist evaluation14 approach to investigate the impact of IR in hospital wards on organisation, delivery and experience of care.15 For the first phase of this evaluation, a realist synthesis of IR was undertaken with the view to develop programme theories to provide a framework for the analysis. Outcome (O): The outcome is a result of the interaction between a mechanism and its triggering context. As available theory on the potential of IR was limited, the aim of this realist synthesis was to help develop programme theories of IR to generate hypotheses around for whom IR may or may not work, in what circumstances and why. Given that this was the first phase of a larger realist evaluation study, realist synthesis was deemed to be the most appropriate method to use for the initial period of theory development, as it applied a realist approach to retrospective literature reviewing. The realist synthesis was undertaken following practical ‘how-to’ guidance in the field,17 18 and the authors ensured that quality and publication standards in realist synthesis were upheld.21 22 It is acknowledged within the field of realism that a number of different conceptualisations or definitions of ‘mechanisms’ have been identified.18 Box 2 provides definitions of how we have used the Context, Mechanism, Outcome and Programme theory terminology in this review. The realist synthesis was undertaken using a three-stage literature search and a stakeholder consultation event. In stage 1, a search of academic, policy and grey literature was undertaken to develop initial programme theories of IR (ie, purported ideas of ‘what is supposed to happen?’ or ‘how is it supposed to work?’).18 Expert advice was sought from library and information sciences specialists around generating relevant search terms. Between June and July 2014, four electronic databases were searched (Allied and Complementary Medicine Database (AMED), Cumulative Index of Nursing and Allied Health Literature (CINAHL), Medical Literature Analysis and Retrieval System Online (MEDLINE), Royal College of Nursing Archive (RCN Archive), alongside searches of Google, Google Scholar, InterNurse, Science Citation Index Expanded (SCIE) and NHS Evidence, using the strategies highlighted in box 3. Eighty-nine relevant documents were identified and divided between two researchers. One researcher read all the empirical research papers (n=42) and the other read all the grey literature and policy documents (n=47). Both independently examined their documents to identify any purported mechanisms of IR (ie, theories or assumptions about why/how IR worked/was expected to work). Each wrote a brief description of the mechanism based on what they had found and recorded the names of the papers in which they were identified. The researchers then met to discuss their findings. Eight potential mechanisms were identified in the empirical research papers, and six of these mechanisms were also identified in the policy documents (see table 1). Where both researchers found a similar mechanism, they each briefly described what they had found and combined these descriptions together to produce the mechanism names and joint definitions. When mechanisms were only identified by one researcher, the other also read the paper(s) in which they had been identified and provided their input into the mechanism name and description. Through consensus, a combined list of eight mechanisms of IR was produced (table 1). A similar process was undertaken for context (table 2) and outcomes (table 3). Thirty-five papers met the inclusion criteria and were included in the synthesis at this stage. The evidence collected from these papers was synthesised by drawing together all information on contexts, mechanisms and outcomes. Similarities and differences in findings were sought to build a comprehensive description of each mechanism and its role in IR. Due to the small number of papers identified for the ‘patient empowerment’ mechanism, focused literature searches specifically for this mechanism were also conducted, although no new papers were identified. A stakeholder consultation event was held in February 2015, involving service user representatives and NHS clinical staff (n=28), to discuss the mechanisms, contexts and outcomes arising from the synthesis, to ensure none had been missed, and to decide whether or not the researchers should focus only on particular mechanisms or to continue the synthesis with a broader focus.22 The stakeholders felt that the synthesis was appropriately focused to achieve optimal end-user relevance and that further refinement was not required at this stage. 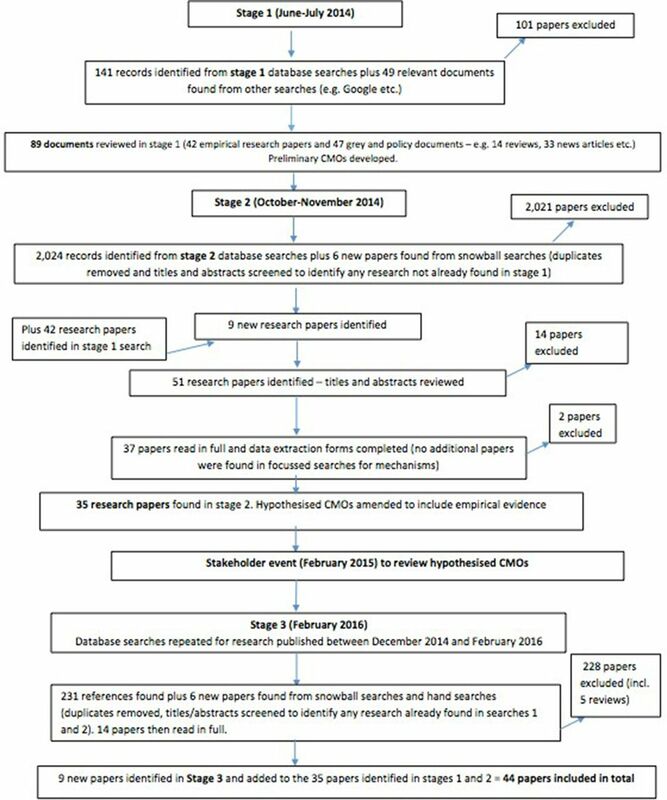 A third and final search of the literature was undertaken in February 2016 to ensure the synthesis was up-to-date and that no research published in the interim period had been missed. Stage 2 searches were repeated but focused only on research published between December 2014 and February 2016. Snowball searches and hand searches were undertaken and a further nine relevant papers were identified (44 papers in total, 1 early online). Data extraction forms were completed for each newly identified paper and any evidence added into the hypothesised CMOs. A document flow diagram for the synthesis process is provided in figure 1. The 44 papers were drawn from reports published in high-impact peer-reviewed journals (n=18), the professional press (n=21), four study reports and a doctoral thesis. The papers referred to research undertaken primarily in the USA (n=25), followed by the UK (n=12), Australia (n=5), Canada (n=1) and Iran (n=1). The papers were published between 2006 and 2017, with a peak in publication in 2012. The two earliest published papers (2006 and 2007) were authored by Meade, who was directly connected to the Studer Group, and these papers were heavily cited by authors publishing at later dates. The 44 papers were written by a total of 168 authors, with only 3 authors (Meade,7 24 25 Braide6 26 and Neville27 28) authoring or coauthoring more than one paper. This suggested there had not been a major programme of research or ongoing interest by one group of researchers in IR. Document flow chart of the search process. The synthesis identified a number of discrepancies between how IR is purported to work and how it operates in practice, as well as international differences in how the intervention has been implemented. For example, guidance from the USA states that the structured approach is a fundamental facet of IR and that the intervention should be used in a standardised manner so that all patients receive the same input.2 Yet other countries, including the UK, appear to have adopted a more flexible approach, based on nurses’ clinical judgement of patient need and preference. This is arguably because of differences in the drivers of implementation of IR in both countries. In the USA, IR is a marketed product,2 implemented in response to patient satisfaction surveys determining hospital financial reimbursement.57 However, in the UK, the Francis Inquiry was the major impetus for the widespread adoption of IR, with the aim of providing reassurance to the public at a time of intense media pressure. The UK government has been criticised for promoting IR and urging its introduction within NHS hospitals without being clear on what they were promoting and with no directives on how it should be undertaken or recorded.3 9 The intervention has therefore not been consistently implemented across settings but refined and adapted to suit local circumstances. It is not yet clear whether this flexible approach to IR has had a positive or negative impact on outcomes in the UK. What is clear, however, is that, both nationally and internationally, the intervention that one organisation refers to as IR is not the same as another, nor the same intervention that other empirical studies have evaluated. This leads to an important question of how flexible the approach to the delivery of IR can be before it can no longer be considered IR. Another distinction between theory and practice of IR was highlighted in the ‘allocated time’ mechanism. While it has been claimed by some that IR would give nurses assigned time to care for patients’ basic needs, in the empirical literature, there was no evidence that nursing workload had been reduced or extra resources provided in order to assist nursing staff in carrying out IR. This is likely because, in practice, IR is not seen as a ‘time-requiring intervention’ but as fundamental care which should already be being done. It is little surprise, therefore, that many nurses felt IR was ‘nothing new’ or that it replicated what nursing staff had always done, but with added documentation. The ‘nurse-patient communication and relationships’ mechanism emphasised additional discrepancies by highlighting that IR may increase the frequency of nurse–patient communication, but not necessarily improve its quality. It is conceivable that increasing the frequency of nurse–patient communication alone could safeguard patients in settings where care delivery is poor. For example, reported instances of neglectful care, such as patients not being offered food, drink or pain relief for ‘many hours’ (point 7.314, p662),58 should not occur with an intervention that requires nurses to check these needs at hourly intervals. It is less apparent, however, whether simply increasing the frequency of nurse–patient communication would offer any further benefit to highly performing units or whether this might indeed reduce standards of care by taking nurses away from other key tasks and duties. This synthesis has established that, for many patients, increasing the frequency of communication alone is not enough and that it is the quality of their interactions with nurses that matters. This demonstrates the tensions around standardising nursing input within IR instead of accounting for the different needs of patients in order to provide interactions that are meaningful to them. The weak evidence also did not give sufficient justification for the implementation of IR in the UK. Nevertheless, IR has been widely implemented and therefore the subsequent realist evaluation will focus on testing how contexts, mechanisms and outcomes of IR are configured. This review has shown how IR may work by identifying the programme resources that the intervention offers and how these may be interpreted and acted upon by patients, carers and staff. It has specified how each of these mechanisms may or may not be triggered by different contextual factors and lead to a range of desired outcomes. The clinical outcomes included in this synthesis were specified in the protocol, for instance, call bell use, falls and pressure sores, but this review has also identified experiential outcomes, for example, empowerment, patient and carer satisfaction, and patient awareness of IR. Few studies included patient perspectives of IR. The main limitation of this realist synthesis study was lack of robust evidence relating to IR and specifically the few insights about how IR was expected to work. The 35 of the 44 included studies which attempted this tended to be small, locally based evaluations, many of which relied on staff self-report or routinely collected data. IR outcomes included self-reported patient and staff outcomes, clinical outcomes, health economic and hospital-reported patient outcomes, but the predicted direction of change was not always clear-cut. Of the available evidence, only call bell use; patient, carer and staff satisfaction; pressure ulcers; patient falls; and patient complaint outcomes had a consistent pattern in the direction of change predicted by the majority of included studies, but these had serious methodological and/or reporting weaknesses, so should be treated with extreme caution. Despite the widespread use of IR, this paper highlights the paradox that there is ambiguity surrounding its purpose and limited evidence of how it works in practice. Our conclusions generate, first, understanding of how IR works in relation to context and outcomes; second, clarification of international differences in the drivers behind its implementation; and finally, learning for replication and sustainability of IR. Differences in the implementation of IR identified in the evidence demonstrate the importance of care delivery context and potentially that IR has been adapted in different contexts and over time.16 59 IR has been described as a ‘search for simple solutions to complex problems’,60 and it has been acknowledged that IR should not be perceived as a panacea to all problems.61 The findings of this synthesis agree with both points. It would appear, for example, that IR may well be an appropriate intervention to achieve particular goals (eg, increasing the visibility of nursing staff and frequency of nurse–patient communication) but less appropriate for others (eg, empowering patients or improving the meaningfulness of nurse–patient interactions). Further research is needed to test the eight a priori propositions about how IR may work, for whom, in what circumstances and why, and whether the investment of resources to support IR offers good value for money. We wish to thank our advisory group members and all those who attended the stakeholder consultation event for their time and contributions to the research. Open access for this article was funded by Kings College London.
. Report of the Mid Staffordshire NHS Foundation Trust Public Inquiry, Vol III, Present and future annexes. London: The Stationery Office, 2013. The Studer Group. Best practices: Sacred Heart Hospital, Pensacola, Florida. Hourly Rounding Supplement. Gulf Breeze, FL: Studer Group, 2007.
. Intentional rounding: a critique of the evidence. Nurs Times 2013;109:19–21. Department of Health. Patients first and foremost: the initial government response to the report of the Mid Staffordshire NHS foundation trust public inquiry. London: Department of Health, 2013.
. The Hospital Pathways Project. Making it happen: Intentional rounding. London, UK: The King’s Fund Point of Care and The Health Foundation, 2017.
. Engaging staff with intentional rounding. Nurs Times 2012;108:14–16.
. Effects of nursing rounds: on patients’ call light use, satisfaction, and safety. Am J Nurs 2006;106:58–70. National Nursing Research Unit. Intentional rounding: what is the evidence? 2012 https://www.kcl.ac.uk/nursing/research/nnru/policy/By-Issue-Number/Policy-Issue-35final.pdf (accessed 18 Dec 2017).
. Realist synthesis: an introduction. ESRC research methods programme, methods paper 2. 2004 https://www.researchgate.net/profile/Gill_Harvey/publication/228855827_Realist_Synthesis_An_Introduction/links/0fcfd507f0b7cbb2ce000000.pdf (accessed 18 Dec 2017).
. Realist synthesis Rameses training materials. 2013 http://www.ramesesproject.org/media/Realist_reviews_training_materials.pdf (accessed 18 Dec 2017). RAMESES Project. Quality standards for realist synthesis (for researchers and peer-reviewers). 2014 http://www.ramesesproject.org/media/RS_qual_standards_researchers.pdf (accessed 18 Dec 2017).
. Round bounty. One-hour rounding positively influences patients and nursing staff members. Mark Health Serv 2007;27:23–7.
. The effect of intentional rounding on essential care. Nurs Times 2013;109:16–18.
. Hourly rounding with a purpose. Iowa Nurse Reporter 2011;24:12–14.
. The impact of nurse rounding on patient satisfaction in a medical-surgical hospital unit. Medsurg Nurs 2011;20:327–32.
. Staff and patient views on intentional rounding. Nurs Times 2015;111:16–19.
. The merry-go-round of patient rounding: assure your patients get the brass ring. Medsurg Nurs 2012;21:240–5.
. A report on the implementation of intentional rounding at demonstrator sites for the nursing and care quality forum. NHS England. 2013 http://www.6cs.england.nhs.uk/pg/cv_blog/content/view/81314/76110?ctype=blog&container=76110&cview=81300.
. Proactive patient rounding: developing nursing pratice to improve the quality of patient care. London, UK: Whipps Cross University Hospital NHS Trust, 2010.
. The introduction of intentional rounding to aid falls prevention in an acute stroke unit. Patients first programme, project report. 2012 http://fons.org/Resources/Documents/Project_Reports/PFTauntonJan2013.pdf (accessed 18 Dec 2017).
. Emergency department nurses’ perceptions of the benefits and challenges of hourly rounding (Doctoral study). Minnesota, USA: Walden University, 2013.
. Caring around the Clock: rounding in practice. Nurs Times 2012;108:12–14.
. Evaluating a major innovation in hospital design: workforce implications and impact on patient and staff experiences of all single room hospital accommodation. Southampton (UK): NIHR Journals Library, 2015.
. Hourly rounding: a replication study. Medsurg Nurs 2012;21:23–36.
. Report of the Mid Staffordshire NHS foundation trust public inquiry. Volume 1: analysis of evidence and lessons learned (part 1). London: The Stationery Office, 2013.
. Essay 7 - Contextual issues and qualitative research. In: Raine R , Fitzpatrick R , Barratt H , Challenges, solutions and future directions in the evaluation of service innovations in health care and public health. Health Services and Delivery Research, No. 4.16. Southampton (UK): NIHR Journals Library, 2016.
. "Rounding is an evidence-free idea driven by political whim". Nurs Times 2013;109:9. Contributors RH conceived the study. RH, SS, ND and KS undertook data extraction and synthesis. All authors revised the manuscript critically for intellectual content, and agreed and approved the final version to be published. Funding This project was funded by the National Institute for Health Research Health Services and Delivery Research Programme (project number: 13/07/87). Disclaimer The views and opinions expressed therein are those of the authors and do not necessarily reflect those of the National Institute for Health Research Health Services and Delivery Research Programme or the Department of Health. Ethics approval NHS Health Research Authority South East Coast - Surrey Research Ethics Committee.